New research describes how unique characteristics of a protein called Dps helps bacteria survive starvation and other stressful conditions. The findings, which appear in Cell, may lead to more targeted antibiotics and other drug therapies. Bacteria cause many serious illnesses, such as food poisoning and pneumonia. The challenge for scientists is that disease-causing bacteria are extraordinarily resilient. For example, when bacteria like Escherichia coli (E. coli) undergo starvation, they can reorganize their bacterial DNA. In order to accomplish this feat and up their chance of survival, E. coli strains dramatically increase Dps, which compacts the bacterial DNA into a dense, crystal-like complex and protects it from damage. While previous research indicated that Dps is what protects bacteria from succumbing to starvation and other stressors, researchers did not know how this special protein worked until now. Imagine that each of the strands of DNA in your cells are individual recipes. To make hair, you would pull out the hair recipe card. To digest your food, you would follow the digestion recipe card and express the gene “ingredients” in that recipe. When you’re cooking, however, you don’t want to have all your recipes out in the kitchen at once, so you protect them by storing them away in a recipe box and pulling out the ones you need at the moment. Cells in higher organisms such as plants and animals don’t contain Dps. But they do something similar, says Elio Abbondanzieri, a research associate at the University of Rochester. Whenever DNA is compacted in higher organisms, the compacted genes are then less likely to be expressed. The researchers thought they would see the same effect in bacteria, a lower organism, when the bacterial DNA is compacted by Dps. While Dps did compact the bacterial DNA, the compaction didn’t have any effect on the expression of the genes. The enzyme that expresses, or transcribes, genes—RNA polymerase (RNAP)—was able to bind to DNA and express genes equally as well whether or not Dps condensed DNA during times of stress. What, then, is the main role of Dps, if gene expression is preserved whether or not it compacts bacterial DNA? 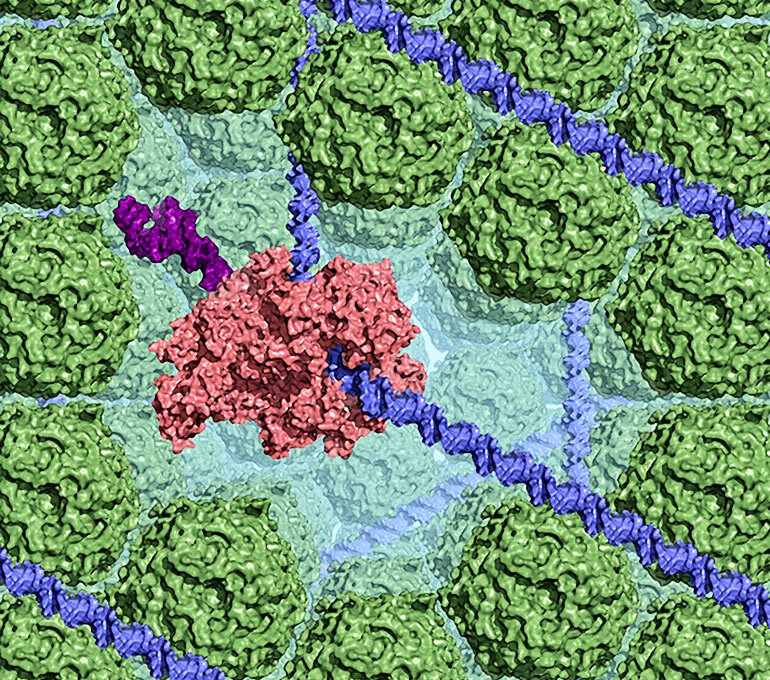 The researchers observed that while RNAP still had full access to the Dps-compacted DNA, the compaction completely blocked other proteins that could cut and damage DNA. Therefore, they theorize that Dps may condense bacterial DNA to protect it from breaking or mutation, while still allowing the bacteria to express genes that help it fight stressful conditions. If this is the case, localized effects further enhance the protective action of Dps when it binds to DNA. For example, Dps can neutralize iron, an element that causes extensive damage to DNA. Recognizing the effects of Dps could lead to the development of more targeted antibiotics, the researchers say. The research could potentially lead to radical new therapies that employ Dps as a shield to protect human DNA in high-stress environments, such as areas with high levels of radiation, Meyer says. Could Dps be used in humans or other higher organisms to protect DNA while still allowing it to carry out its other functions? “I have no idea if this would work, but I think it would be really interesting to try out in a laboratory setting,” Meyer says.